Although T. E. Lawrence, commonly known as "Lawrence of Arabia", died in 1935, the story of his life has captured the imagination of succeeding generations. Seven Pillars of Wisdom is a monumental work in which he chronicles his role in leading the Arab Revolt against the Turks during the First World War. A reluctant leader, and wracked by guilt at the duplicity of the British, Lawrence nevertheless threw himself into his role, suffering the blistering desert conditions and masterminding military campaigns which culminated in the triumphant march of the Arabs into Damascus. 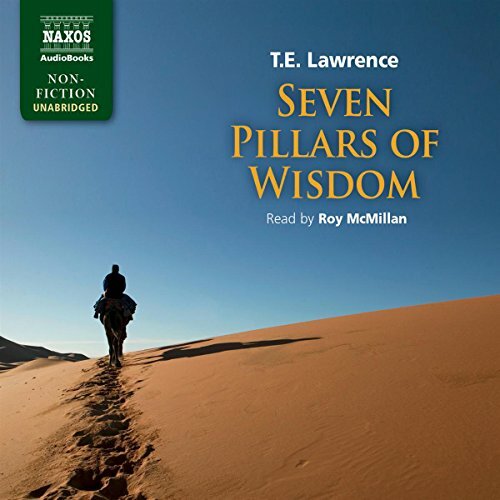 Would you listen to Seven Pillars of Wisdom again? Why? Yes. I have been listening to it again. This memoir has so much detail, and so much happens, and it is so full of strange sounding names of tribes and tribal leaders and places, and so much intrigue, that it is possible to thoroughly enjoy going through it once to get the big picture and then go through it again to go over the details you missed the first time and still thoroughly enjoy it the second time! What was one of the most memorable moments of Seven Pillars of Wisdom? There are so many it is difficult to choose, and so much variation. I love the descriptions of Auda of the Abu Tayi and his various exploits. He is such a larger than life character, its almost difficult to believe that such an extraordinary person ever lived. The way Lawrence wrote about Auda, he seemed clearly in awe of him. Some of the battle descriptions are quite grim, but particularly disturbing was the description of his capture and torture by Turkish troops. I thought he did a fantastic job. His accents, his timing...I couldn't fault it. I laughed on a few occasions, but more often I found myself going "ewww". One of the things that is striking about this book, particularly bearing in mind when it was written, is that it is very personal and honest and Lawrence lets you see inside his head and often enough you would rather not look but he was such an extraordinary and strange man you can't stop yourself listening. Absolutely! The story captivated my imagination and I felt like I was stood by the side of Laurence throughout is journey. T.E. Laurence was the main character and so it's without a doubt that he is the leading character. The narrator brings this story to life so well it sounded like he himself was Laurance. The long distances that Laurance endured on camel and the moments of complete isolation bring it home how humans can struggle through and make the most of bad situations, even through these difficult times Laurance still captures the beauty of the Middle East his discription of the surrounding areas and the people he travelled with is like poetry. Nothing is left unsaid and the simple purity in the writting brings you in to his world. For those who would like to get a better understanding of the early times of the Middle East and with a perspective that is non biased this is the book for you. With modern events and with difficulties currently in the region it would be wise for those who make comments with out a factual bases to take a moment to step back into history and get a better idea of the reasons why modern day Islam has come about. Roy McMillan reads this so well. As the book was written for others. that could perhaps explain if one needs explanation, why this book is so intimate. It has the feel and resonance of letters from a friend. Also Lawrence's style of writing, what he writes about, moving through the experiences, the people and events and places that all contribute to a great account. He was an archeologist working in the Middle East before being asked to work with the Military Intellegence. The pdf is helpfull, giving times and chapters as well as a simple map. If you are like me you will find some excellent links through Wikipedia and well, just surfin. So I have listened once since downloading and spent as much if not more time searching the web. The events in 'Seven Pillars' are almost 100 years old. The decisions of Super Powers of the day, still influence us today. While a lot has been written about the man, it is good to hear or read his own account. Keeping in mind he was with the British Military Intellegence at the time there are no doubt many things he did not write about. And yes, I am thankfull Lawrence wrote Seven Pillars of Wisdom. Armed with better maps and Bio's my second read will be very slow. For a long time I have wanted to read "Seven Pillars of Wisdom" I am glad I didn't. I never would have put in the fantastic narration that gives this book a life. Roy McMillan puts so much verve in the interpretation, all the characters have their own voice. This book is true history as it comes from Lawrence's confused mind.. It has action , of course, camel rides for days under the most sever conditions,rides in Rolls Royces filled with high explosives intrigue, betrayal tense page turner. I listened to it in two days. It' fantastic! I believe you'll love it. There isn't a work of fiction that can rival this incredible true story; it's as if most works of fiction strive to achieve what happened for these two years in the deserts of Arabia through the eyes of a single, odd Englishman during World War I. There were parts of the books I struggled with - mostly the names and places. Maps are helpful, but maps lead to outright historical documents to me laid next to the book for quick consulting and then I'm not even reading the book proper anymore - so I dispensed with any hope of knowing who all the people were and focused on those that mattered, namely Faisal, Auda, and the brief moments of Allenby. The language of the Arabs is very foreign sounding so it got a little confusing keeping everyone straight in my head and I was grateful when he resorted to generalizations such as calling a group 'The Australians'. Other parts weren't clear because so much time has passed since the events here (nearly 100 years) that people and events who were probably quite well known when the book was first published have faded into history or have been too confused with David Lean's masterful film "Lawrence of Arabia". The one part of the book I had been told would be tedious was the part I found not only the most fascinating, but also the most crucial : the landscape. But Lawrence wrote so much of the landscape because that is what the Arabs were fighting for and Lawrence wanted to give every grain of sand in Arabia its due glory. And only then after we've turned over every stone, every burning lava field and slate, every murky well, the supreme glory of Rumm, only after seeing all of this country do we see why they fought the Turks. The cruelty of the Turks in that village, that little girl ... Tallal became the Arab conflict and this is what Lawrence was trying to tell us the entire time. It took that many words, that much detail to get the point across as to why they fought and why they actually came together as a people who normally hated each other to defeat a common foe. And the fact that Fiasal was able to get these tribes to stop killing each other for just long enough to take Damascus and win the war is the most remarkable thing here. Lawrence's story was incredible for sure, but what Fiasal did is unmatched and only Ghengis Khan can surpass such political ability (however Fiasal actually didn't even have to resort to Mongol brutality either). Yet that's the sad thing here too since that corporation lasted for such a short time and has never been seen again. Even now in a post Arab Spring world, there is not much hope of a unified middle east - Saudi Arabia is rich but not trusted (though must be respected because of Mecca). Syria is still reeling and probably always will, and the West Bank and Palestine is in even worse shape. For that brief moment there was hope but it started to fall apart the very hours after the taking of Damascus as the men immediately fought over political control. Maybe that's why Lawrence added the bit about shoveling up the jellied remains of the Turk soldiers an poured those stinking remains into the grave because he knew how vile the whole business of humanity was, how terrible (yet glorious) war was, how petty, how temporal and fleeting life is, how in the shadow of Rumm all of us are utterly insignificant. And he knew it wouldn't last. "Fantasies, these will seem, to such as are able to call them my beginning an ordinary effort". He tried, he gloried, yet couldn't enjoy it, and could never shake that it was all vanity in the end. But what a tale! T.E. Lawrence went home a hero. History still holds him such. But honest men know that as has been typical of other conquerors toward their conquered, the British lied and cheated the Arab people and used them for cannon fodder to reduce loss of British lives. Lawrence went home a hero, but in his heart he more honestly felt himself a failure. In this book he tells the truth of his failures and the emotional pain they bought him. This book is worthy of the library shelves of any serious student of history. I am preparing to visit Jordan and see Petra and Wadi Rum. This trip has been on my bucket list ever since seeing Lawrence of Arabia as a kid. The poetically detailed descriptions of the desert contained in Seven Pillars of Wisdom will greatly enhance my tour. The reading by Roy McMillan was fantastic! you may have seen the movie Lawrence of Arabia, but you haven't felt the experience until you read this book. One of the most interesting stories ever told from a perspective that you'll be hard pressed to find anywhere. To me, Laurence seemed to have great ability and foresight with little ego except that which recognized these forementioned gifts. The personal struggle with his mission and the times gives amazing insight into a historical character that text books lack. One of the greatest books ever written - my personal favorite. The narrator could easily pass for the voice of Lawrence himself. I wish i could give it 100 stars. Absolutely superb!! !